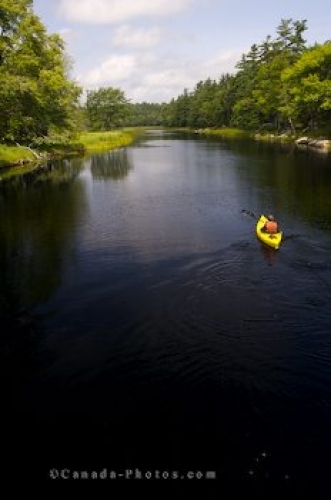 A kayaker enjoys the peacefulness along the Mersey River in Kejimkujik National Park in Nova Scotia, Canada. The calm waters along the Mersey River in Kejimkujik National Park in Nova Scotia, Canada make the conditions ideal for a kayaker. The tranquility is amazing as this kayaker encompasses himself by the wilderness as he slowly paddles between the banks of the Mersey River. Kayaker on the Mersey River in Kejimkujik National Park and National Historic Site of Canada, Kejimkujik Scenic Drive, Highway 8, Nova Scotia, Canada. Picture of a kayaker on the Mersey River in Nova Scotia, Canada.